We are delighted that DoorJammer has been accredited by Secured by Design (SBD)*, the official UK Police flagship initiative supporting ‘design out crime’. SBD is owned by the Association of Chief Police Officers (ACPO). DoorJammer had to pass Secured by Design’s enhanced performance tests, which are independently monitored. These included DoorJammer withstanding impact tests* with a 50kg (110lb) weight being applied to the door. Works on all doors with at least 1/8" gap below the door: it can be fitted to most doors in seconds. Attempted forced entry will 'jam' the door shut and provide both security and privacy. 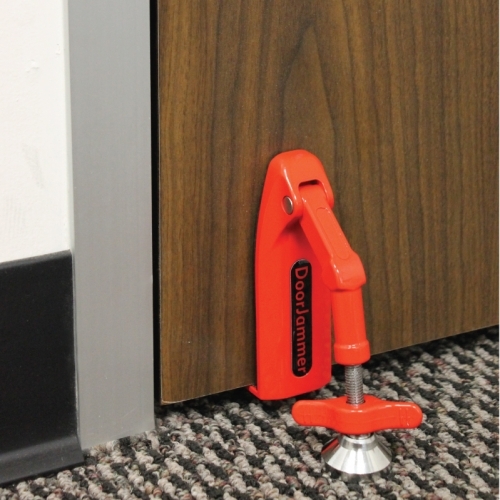 Compact and lightweight making it great for travel: with a weight of only 8 oz and size of 4 3/4" high and 2 3/4" wide the DoorJammer makes the perfect travel companion. Easily slips inside your purse, suitcase, or backpack.